mens large diamond ring vs-2 top wesselton color center stone 1.19 carat. 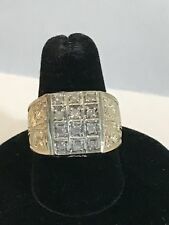 18k Yellow Gold Men's Dragon Diamond Cut Large Ring. This page was last updated: 19-Apr 12:16. Number of bids and bid amounts may be slightly out of date. See each listing for international shipping options and costs.